Anyway after a few hours browsing through ‘Homes & Gardens’ style magazines I decided that interior design, for me at least, isn’t half as exciting as my time spent in the kitchen. And so this week I’ve parked the mood board for now and I’m back sharing with you how to activate nuts. Nuts are my favourite snack food. Most days I nibble on a handful of almonds, walnuts, macadamias or pecans. They’re packed with healthy fats and lots of other good stuff. And with the rise of paleo, gluten free and vegan diets nuts are appearing in all kinds of recipes. Not convinced? I wasn’t either until I tasted activated nuts. It was then I realised that the extra effort is worth it – not because of the health credentials but rather because activated nuts taste so much better. So what’s involved in activation? It’s really simple. Activated almonds have received a lot of publicity here in Australia but all varieties of nuts can be activated with the same method. In a ‘nutshell’ it’s just a matter of soaking nuts in filtered water and then drying them out. My latest batch was the walnuts you see here. Fill a bowl with filtered water and dissolve a reasonable amount of sea salt or Himalayan salt into the water. Then add the nuts. Allow to soak for 2 to 12 hours depending on the type of nut (see below for a guide to soaking times). 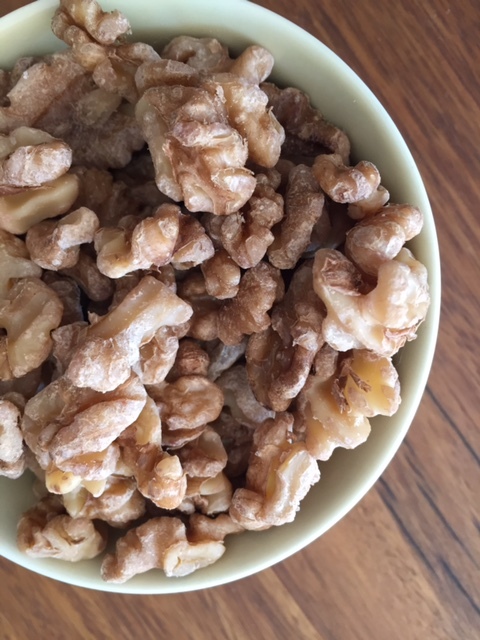 Drain the nuts and rinse with more filtered water. Then pat dry with paper towels. Evenly place the nuts on a baking tray ready for drying. It’s optional at this stage to sprinkle them with your chosen spice mix. Nuts typically take 12-14 hours to dry. You can do this in the oven on the lowest setting (around 50C) or if you’re lucky enough to have one use a dehydrator. 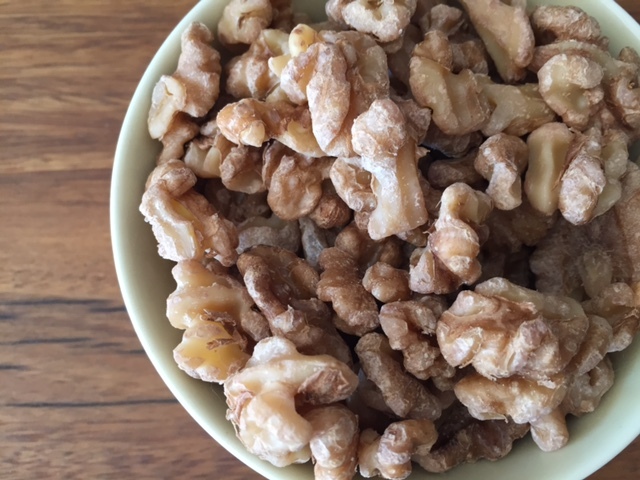 The nuts are ready to eat when they feel completely dry and taste crisp and crunchy. This can take as long as 24 hours. Once dry store them in an airtight container in a cool dark spot. Tip – another way you can dry the nuts (if you have a warm sunny day) is to place them on a side table in a sunny spot where they will soak in the heat. Of course you can’t have a party without some nuts to nibble on – so I’m sharing this post at Fiesta Friday #133 – this week’s party is brought to you by the lovely Angie. Tags: activating nuts, almonds, benefits, how to, nuts. Bookmark the permalink. Laura- great post! I will try this, I’m curious about the flavor after being activated. I am a nut lover so this is great! Thanks Michelle – if you love nuts then its definitely worth experimenting with activating them – let me know how you go! Hi Linda – I have actually been drying mine in my warming drawer or in direct sunlight. It would depend on your room temperature and humidity whether they would dry on the kitchen counter – it would take a lot longer…. Thanks for sharing, Laura! I had no idea, this is new to me… I have lots of nuts and seeds as I like to add them to salads, oatmeal, etc. great tip! This is the first time I have heard of activating, thank you. I am going to try this. Laura, I had no idea about activating nuts. Though my mom always soaked our almonds and we ate then next day morning. She did not roast them so we got used to eating overnight soaked and then peeled almonds. That’s so interesting that your mum used to soak them – perhaps she knew there were benefits. And I believe the actual activation comes from the soaking rather than the heating process…..